After a steady increase in its score, Cassandra now passed Teradata and made it into the prestigous top 10 out of 193 database management systems. Interestingly, HBase, another wide column store, also made notable gains in its score since the beginning of this year. 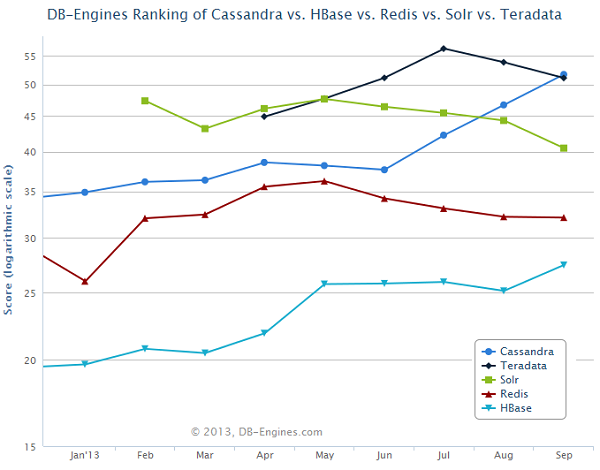 Cassandra is a top level Apache project, heavily backed by Datastax. It is, besides MongoDB, Redis, Riak, Couchbase and a few others one of the prime candidates to survive a future consolidation of the young NoSQL market.